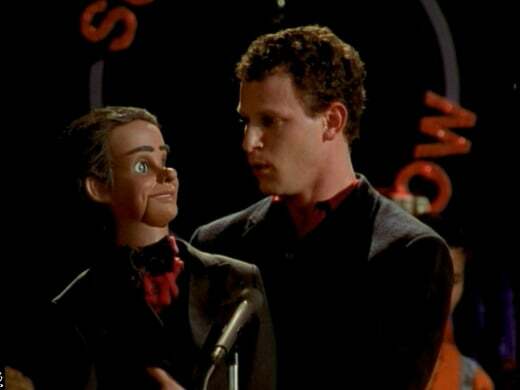 Buffy the Vampire Slayer Season 1 Episode 9 introduced two scary things of the night: dummies, and performing at a school's talent show. Actually...the talent show is scarier. Let's jump into rewatching "The Puppet Show" to find out why. How do the Scoobies always get roped into bad situations? It can't just be bad luck. My theory is Principal Snyder is going out of his way to punish them. He didn't have to force Giles to run the talent show, or have the Scoobies perform in it, he made it happen. He enjoys torturing them. 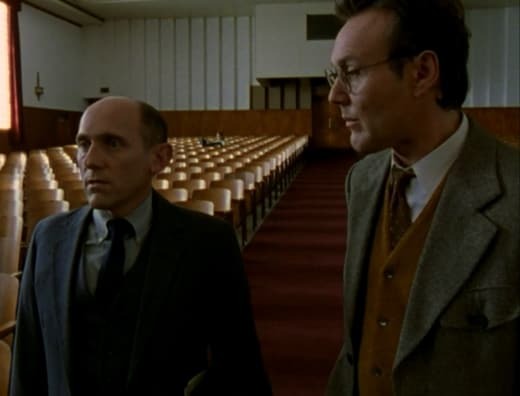 Principal Snyder has always been a constant throughout the early years of Buffy the Vampire Slayer. He's the minor recurring villain who only is there to hurt the heroes. Nothing good, only bad. I wish I could love-to-hate him, but I only hate him. Buffy, Xander and Willow's reluctance to perform is the perfect segway to the following episode, Buffy the Vampire Slayer Season 1 Episode 10. We see the first few hints of their fears here. Willow has major stage fright, and it's not even manageable. She's completely terrified of doing anything public. This fear might possibly explain her wallflower tendencies. She chooses to fade into the background instead of standing out. Willow is afraid of the spotlight. Buffy: Giles...into every generation is born one who must run the annual talentless show. You cannot escape your destiny. Giles: If you had any shred of decency, you would have participated, or at least helped. Buffy: Nah. I think I'll take on your traditional role...and watch. Before the killer reveal, Emily's death was the first time a human had possibly committed a crime at Sunnydale High without any supernatural connection. There's a knife, a dead body and no demon markings. Whereas Fritz killed Dave on Buffy the Vampire Slayer Season 1 Episode 8 for Moloch, the Scoobies had no reason to think demon here. It looked like a human killing. Buffy: No, wait. I’m not buying, you guys. Remember the hellmouth? Mystical activity is totally rife here. This to me says demon. Giles: I’d like to think you’re right. A demon is a creature of evil, pure and very simple. A person driven to kill is...is...um...it's more complex. Willow: The creep factor is also heightened. It could be anyone. It could be me! Permalink: The creep factor is also heightened. It could be anyone. It could be me! I liked seeing them do their investigative work to find out the killer. We don't see much of Sunnydale High or its students when they're not involved in the mystery. Especially when those students aren't being killed or harmed by demons, witches and vampires. Learning a bit of backstory was a nice breather. I'm so curious about the rivalry between the dancers and the band. Morgan, and his puppet Sid, were obviously the red-herrings. Everything about them screamed suspicious. Who wouldn't think they're up to something when you overhear Morgan talking to his dummy?! In fact, "The Puppet Show" had a lot of red-herrings in it. Morgan, Sid AND Principal Snyder were made out to be the potential killer. Kudos to the editors and the camera crew for their work in setting the mood. Snyder came off as the biggest possible murderer before they revealed it in the end. Willow: I think dummies are cute. You don't? Buffy: Ughhh. They give me the wig, ever since I was little. 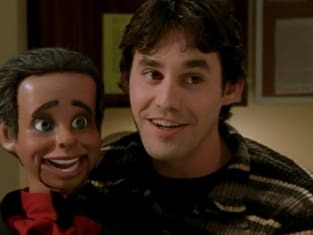 Buffy: I saw a dummy. It gave me the wig. There really wasn't a story there. Permalink: I saw a dummy. It gave me the wig. There really wasn't a story there. Why did nobody believe Buffy about Sid attacking her? The town is quite literally above a hellmouth, and the group has fought vampires, witches and demons so far. They experience paranormal enemies and creatures on a weekly basis. A possessed dummy shouldn't be out of the question. 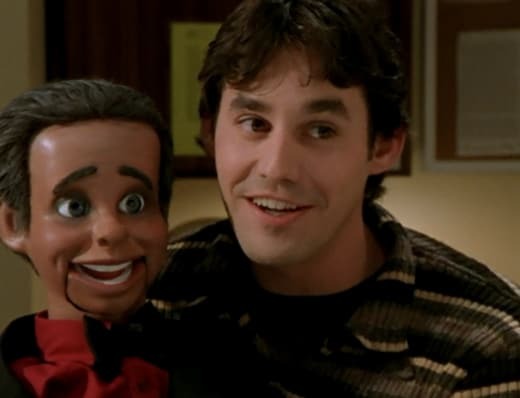 I didn't like Xander trying to make Buffy out to look crazy. She has Slayer intuition. Listen to her! Add this conversation to the long list of reasons why Xander is the worst. It's sad to see Morgan get killed by the demon. He looked like he was in a lot of pain from the brain cancer. And knowing that he died once he lost Sid makes it even more depressing. Sid was his protector. I never thought Sid was the demon. There was definitely something off about him, but I expected it to be a red-herring. He seemed too obvious as the enemy. His real backstory, on the other hand, I never would've guessed. Sid: You win. Now you can take your heart and your brain and move on. Buffy: I’m sure they would’ve made great trophies for your case. Sid: That would’ve been justice. Buffy: Yeah, except for one thing...you lost, and now you’ll never be human. Sid: Yeah, well neither will you. Permalink: Yeah, except for one thing...you lost, and now you’ll never be human. So...he's a demon hunter trapped in the body of a dummy? I had a lot of questions about this. Has he been in dummy form all these years? Who placed him in the dummy? Did he kill any of the seven demons before being in a dummy? His backstory was too brief and light. Even though he drops a major history fact, like he interacted with a previous vampire slayer from the 1930s. That's a big deal. We're meant to take his word that he's been on the hunt for these specific demons all his life. 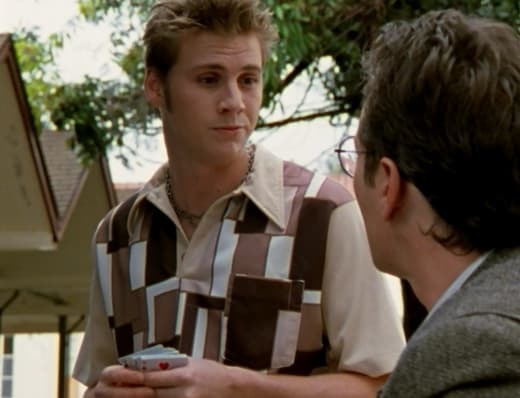 But how did he know Marc was at Sunnydale High? If Marc is a demon who's lived for many years, why would he pretend to be a teenager in high school? And why would he actually attend class?! Too many plot questions here. This reminds me a lot of The Vampire Diaries. I'm glad we can count on Cordelia to lighten the mood. Even as the queen bee, she's the perfect comic relief. Her singing was so bad! Though, one of the best parts of "The Puppet Show" is when Giles made her worry about her hair. Cordelia has different priorities from the other Scoobies; this showed what's really important in her mind. Cordelia: There's something wrong with my hair? Giles: Xander was right. It worked like a charm. Permalink: There's something wrong with my hair? As we'll see in Buffy the Vampire Slayer Season 1 Episode 10, this is one of her biggest fears. Cordelia has great hair. You don't mess with her hair. I think we've found her weakness. There were a lot of problems with the takedown of Marc. Vanquishing the demon was fine, but it's how it played out that left me scratching my head. When Buffy and the Scoobies figured out Giles was a target made sense. He's an intelligent man and they knew someone in the talent show was the demon. Obviously they had to rush after him. The same goes with him being trapped. He offered to be Marc's assistant for the show and he got locked into the guillotine. My problem, however, is the timing between Buffy finding out the truth and them saving Giles. We only saw a few tiny minutes of Marc tying Giles up and cutting the ropes. Buffy had just left the library. She ran really fast to stop him from making the last cut. How close is the library to the theatre? Did she know to check the stage? It all seemed too seamless to find him in the knick of time. The same goes with Marc transforming back into his demonic form. Buffy had only hit him a few times and his features started appearing. However, only a few minutes later in the magic box he turned into full demon. That was mere seconds! Was that because of the fight or did he turn monster by choice? The biggest issue I have is the sound and location. The Scoobies fought Marc behind the large curtain on the talent show stage. How did nobody in the audience or backstage hear them fight? Why did no one from backstage come running out to see them? Everyone was too surprised to see them after vanquishing a demon. I don't believe it. Regardless of how soundproof that curtain may have been, people backstage would've heard demon Marc break through the box. Somebody would've seen their fight. Still, this climax is one that has always nagged me. Sure, I love the awkward dramatic reading in the post-credits scene, but it doesn't hide the plot holes which happened before. And the evidence that is still on stage, like Marc's dead demon body. I liked that "The Puppet Show" gave us a nice break from vampire storylines. It still is an hour I like rewatching from Buffy the Vampire Slayer Season 1. However, similar to Buffy the Vampire Slayer Season 1 Episode 6, there are simply too many questions left unanswered that never get answered. What did you think of "The Puppet Show"? Would you see the Scoobies perform their dramatic reading? 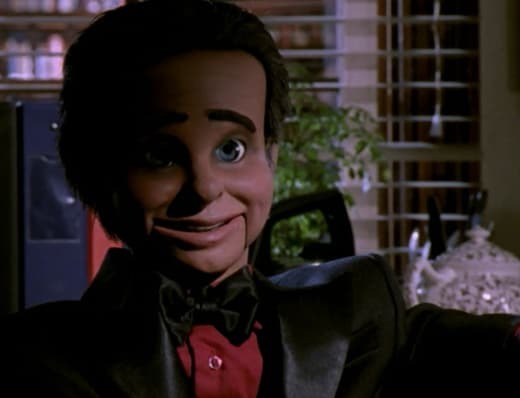 Was anyone else creeped out by the puppet? Want to join us in rewatching Buffy the Vampire Slayer? We will be posting new rewatch posts every Tuesday and Thursday. Come back here and share your thoughts about the episode.